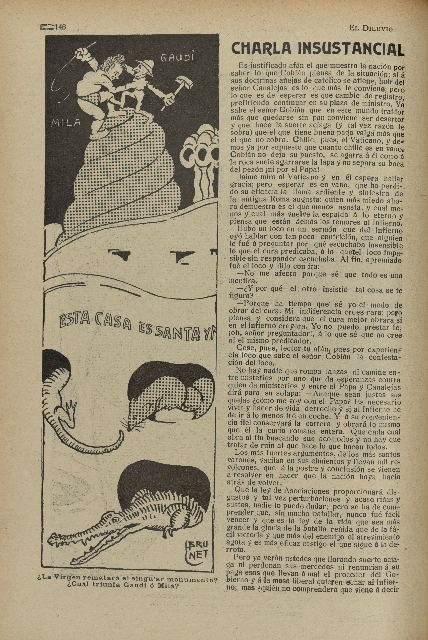 The first drawing was featured on the supplement’s cover on Saturday 5 March 1910, when construction work on the façade of the Casa Milà was nearing completion. Bru-Net’s rendering portrays a phantasmagorical building. 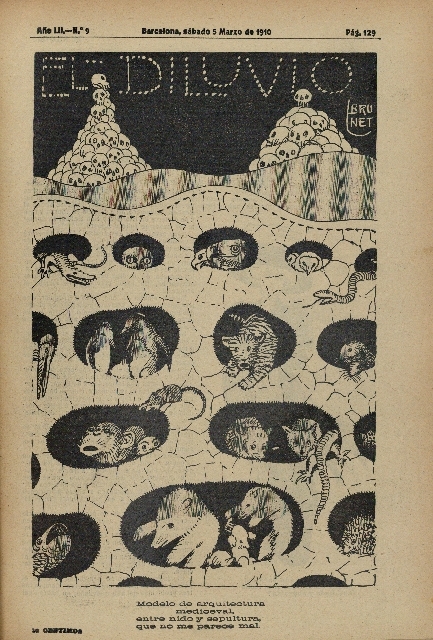 “The rounded hollows of the façade have been turned into dark holes through which all manner of creatures crawl in and out: not only crocodiles and rats, but also snakes, hedgehogs, owls, sea monsters...” as aptly described by Juan José Lahuerta. Two sinuous lines top the building, which is silhouetted against a jet black sky. The roof terrace, chimneys, ventilation towers and badalots (stairwell exits) have been transformed from ‘whipped cream’ mountains into sinister pyramids of skulls. “Model of architecture / medieval / between nest and sepulchre / which does not seem bad”, writes Brunet below the drawing” (‘El costillar de La Pedrera’, Residencia, No. 8, 1999). The second and third illustrations appeared in the same issue of the supplement (25 February 1911) but on different pages. On page 122 Bru-Net’s draws the Casa Milà as “The Lenten House”. The wrought iron balconies are dried cod tails and a sign hanging from the cornice reads “Major exhibition and sale of cod tripe”. A caption below the caricature states “apartment for rent and it’s not bad for selling cod after Carnival season”. The aesthetic impact of Gaudí’s work is unequivocal. The third and last text exemplifies the disputes between the architect and the building’s owners, in particular Gaudí’s desire to crown the building with a sculpture of the Virgin and Child. Word has it that when Milàs saw the model of the sculpture made by Carles Mani, he expressed deep disapproval. Other theories hold that because the model was presented to the couple during the 1909 Setmana Tràgica (Tragic Week) – when convents and churches were being razed in Barcelona – the Milàs did not dare to have a religious piece placed on top of the building for fear of provoking further anticlerical unrest. This episode marked a low point in relations between Gaudí and the Milàs, which did not go unnoticed by caricaturists like Bru-Net. According to Gaudí expert Joan Bassegoda Nonell, “The cartoonist drew a Pedrera with crocodiles and gigantic mice peering out of the windows below a slogan on the cornice that reads: “This building is holy and...”. Above, atop one of the badalots a fight has broken between a Milà, dressed in a loincloth and wielding a whip, and a bizarre-looking Gaudí, with a pith helmet, swinging a hammer while tugging at his patron’s hair. The caption below the caricature reads: “Will the Virgin crown the singular monument? Who will prevail, Gaudí or Milà?” (‘La Casa Milà y la devoción mariana de Gaudí’, La Vanguardia, 10 July 1988). 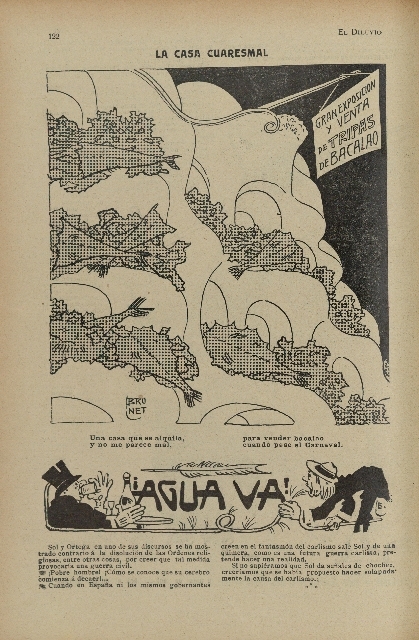 The caricatures are by Llorenç Brunet i Torroll (Badalona, 1873 – Barcelona, 1939), draughtsman and watercolourist, who contributed to the publications L'Esquella de la Torratxa, La Campana de Gràcia and El Diluvio. Suplemento Ilustrado , signing his drawings as Bru-Net. El Diluvio. Suplemento Ilustrado was published from September 1904 to 26 August 1911 as a weekly supplement of the periodical of general information El Diluvio (Barcelona, 1879-1939) This Spanish language daily, staunchly republican and anticlerical, was very popular in Barcelona for its campaigns against the local administration and for its systematic opposition to everything. Contradictory and scandalous, it was one of Barcelona’s biggest selling newspapers.